Federal University of Agriculture, Abeokuta (FUNAAB) 26th Convocation Ceremony Schedule and Programme of Events for Undergraduate and Postgraduate 2016/2017 Academic Session. 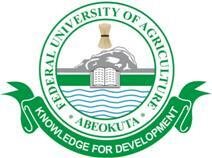 The Authorities of the Federal University of Agriculture, Abeokuta [FUNAAB] has announced that Preparations are in top gear as the institution is set to hold its 26th Convocation Ceremony for the 2016/2017 academic session. CONVOCATION LECTURE Topic: "Food and Us, Poverty, Policies and Politics". Please, note: It is mandatory for all Graduating Students to attend the Convocation Lecture.